We sell pre-owned jewelry from Native American nations across the U.S. and from Eskimo/Inuit peoples in Alaska. Items range from fifteen years to eighty years old. While our mission is primarily to support living artists, we occasionally come across work that cannot be obtained new, or that fills a particular niche of jewelry at a reasonable price. We hope you enjoy the work. Call us at 207 967-2122 if you have any questions. c. mid-2oth century bracelet with three turquoise cabochons, stamped designs, and other adornments. While this type of jewelry is often referred to as Fred Harvey style, it was often made by one of several other dealers who employed Indian workers. Total inside circumference of 6 inches, including 4 3/4 inches of silver and 1 1/4 inches opening. c. 2nd - 3rd quarter 20th century. 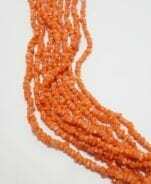 Vintage Six Strand Coral Necklace A six strand necklace of short coral branches of an orange color. The coral tests as natural; i.e., no dyes. It is likely of Pueblo origin. The coral is strung on synthetic red string and is finished with sterling silver tips. 18 in. Sterling silver clip-on earrings with beautiful green turquoise cabochons; silver beads and beaded wire surround the cabochons. The stones have a rich patina. 3/4 inch diameter c. 2nd - 3rd quarter 20th century. Vintage Fred Harvey Style Bracelet Entrepreneur Fred Harvey sold jewelry from the early 1900's until the middle of the 20th century, made primarily by Navajo artisans. Though there were several other prominent workshops operating during the same period, the jewelry is commonly known as Fred Harvey style. This bracelet is stamped with a Thunderbird on either side, as well as geometric shapes. The silver has developed a fine patina, and the four turquoise cabochons have darkened with use. Inside of bracelet measures 6 9/16 in., including a 1 3/16 in. opening; 1/2 in. wide; 1/16 in. thick. The bracelet shows expected wear. Vintage Shell Heishi and Bead Necklace A lovely necklace from the collection of an ardent lover of Southwestern Indian jewelry. Rectangular shell beads are interspersed with standard heishi beads. All are carved from a whitish shell with light pink hues and the occasional shot of brown. The coral is strung on a double strand of synthetic white string and is joined with a sterling silver clasp.. 27 1/2 in. Vintage Navajo Deep Stamped Bracelet From an extensive 20th century collection of Native American jewelry comes an attractive deep stamped Navajo sterling silver bracelet with geometric and starburst shapes and a background of vertical lines. Inside of bracelet measures 6 1/8 in., including a 1 3/8 in. opening; 3/8 in. wide; 1/8 in. thick. This bracelet has a hefty feel and will last a lifetime, if not longer. The bracelet shows expected wear in the form of minor surface scratches. Vintage Navajo Stamped Bracelet From an extensive 20th century collection of Native American jewelry comes an attractive Navajo sterling silver bracelet stamped with ovoid and other shapes. Inside of bracelet measures 6 1/2 in., including a 7/8 in. opening; 3/8 in. wide; 1/16 in. thick. The bracelet shows expected wear in the form of minor surface scratches. Vintage Two Strand Coral Necklace From a 20th century collection of Native American jewelry, we have a two strand necklace of coral branches of a beautiful red color with sterling silver tips. 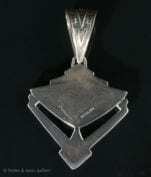 The necklace is likely of Pueblo origin. The coral is strung on synthetic red string. 27 1/2 in. Ray Tracey's jewelry designs have influenced many contemporary Native American artists. This ring is pre-owned, but is in good condition. The band is adorned with geometric designs in bas relief, with textured and oxidized backgrounds. The inlay's position sets this ring apart from the ordinary. While the inlay materials are intact, they are not as highly polished as they were. The inside of the ring displays the RT hallmark, indicating an authentic Ray Tracey design. Size 7 1/4 ring; band tapers from 3/16" to 1/8". Ray Tracey's jewelry designs have influenced many contemporary Native American artists. This ring is pre-owned, but is in good condition. The angled design of the band creates a sensual design. While the inlay materials are intact, the coral and mother of pearl are not as highly polished as they were. The inside of the ring displays the RT hallmark, indicating an authentic Ray Tracey design. Size 7 ring; band tapers from 3/8" to 1/4". Vintage Five Strand Melon Shell Necklace The rich, warm color of melon shell heishi beads contrasts beautifully with the deep green stones interspersed within this five strand necklace from Santo Domingo Pueblo. 24 in., finished with sterling silver tips. Vintage Coral Necklace From a late 20th century collection of Native American jewelry, we have a nine strand necklace of coral nuggets. While the exact origin is unknown, it is likely of Pueblo origin, sporting the traditional wrap. 31 1/2 in. 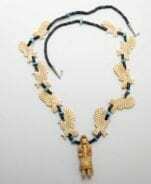 This vintage fetish necklace has a shaman wearing a bird headpiece as the centerpiece, surrounded by eagles interspersed with melon beads and occasional turquoise nuggets. 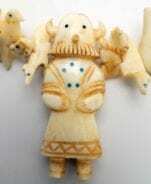 The bird man is made of two pieces of bone, joined before it was carved. The eagles also appear to be made from bone. The necklace is finished with sterling silver tips. Necklace is 35"; bird man is 2 5/8 in. high x 7/8 in. wide x 1/2 in. deep. Origin of the necklace is a New Mexico Pueblo, possibly Zuni or Santo Domingo. Kachina Animal Necklace This vintage fetish necklace has a horned mudhead Kachina as the centerpiece, surrounded by a dense mixture of birds and animals. The Kachina is inlaid, as are a few of the birds on the necklace. The majority of the birds and animals have pigmented eyes. 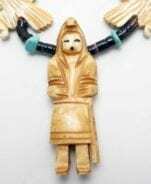 The Kachina is made of two pieces of bone, joined before it was carved. The small animals and birds also appear to be made from bone. The necklace is finished with wrapped string. Necklace is 36"; kachina is 2 3/8 in. high x 7/8 in. wide x 1/2 in. deep. 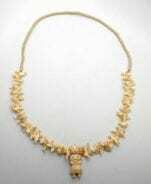 Origin of the necklace is a New Mexico Pueblo, possibly Zuni or Santo Domingo. Former U.S. 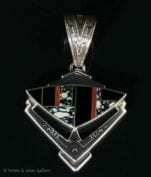 Senator Ben Nighthorse Campbell of Colorado is known for his exquisite jewelry designs. This previously owned bracelet is inlaid with deep blue lapis lazuli, with contrasting tiles of pink and deep coral, turquoise, and malachite. Sized to approximately 6 1/4", which includes a 1" opening. 5/8" at its widest point, tapering to 3/8". This is a substantial bracelet, at 1/8" thick. A vintage Zuni style bracelet, featuring an Apache Mountain Spirit dancer inlaid on mother of pearl. The inlay includes turquoise as well as various forms of shell. The bracelet has a wonderful patina. 6 1/4" inside circumference, including 1" opening. Medallion is 1 7/8" x 1 3/8"; band tapers to 1/4". The bracelet is silver, but is not stamped. There is no artist stamp or signature. 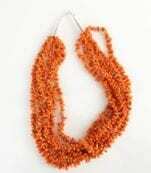 Vintage Coral Cubic Weave Necklace A necklace with orange tubular coral beads woven in a cubic shape. The coral tests as natural; i.e., no dyes. It is likely of Pueblo origin. The coral is strung on synthetic red string. It is finished with sterling silver tips and clasp. 18 in. 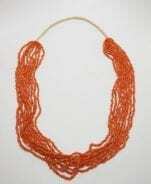 Note: the color of the coral beads is orange; the picture of the short portion of the necklace is more accurate than the picture of the full necklace. 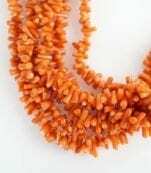 Vintage Single Strand Coral Necklace From a 20th century collection of Native American jewelry, we have a single strand necklace of coral branches of a beautiful red color with a sterling silver clasp. The necklace is likely of Pueblo origin. The coral is strung on synthetic string. 16 1/2 in. Paul Livingston bracelet with Lapis Lazuli From an extensive 20th century collection of Native American jewelry comes an attractive sterling silver bracelet with contemporary banded overlay and a rectangular light lapis lazuli stone. The bracelet has a hefty feel. Bracelet is stamped "Sterling" as well as Paul Livingston, a Navajo silversmith. Inside of bracelet measures 6 1/4 in., including a 1 1/8" opening; 3/8 in. wide; 1/8 in. thick. The bracelet shows expected wear in the form of minor surface scratches; the stone is intact, with no cracks.